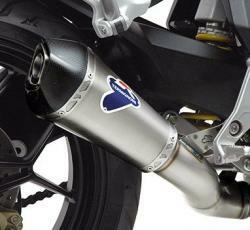 Choose the exhaust for your MV Agusta between various lines of sports exhausts. 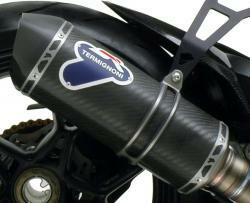 For each model, Termignoni offers both racing and homologated versions. Manufactured from selected high quality materials, the MV Agusta craft exhausts are made of Titanium, Carbon and Stainless steel to guarantee maximum lightness and strength. 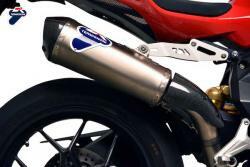 Some models are also available in a full titanium version to further reduce the weight of the system. Design Force, with the characteristic saddle positioning, or Design Relevance with carbon look details. The Termignoni Racing Department has studied different lines to ensure your bike the perfect combination of aesthetics and aerodynamics. 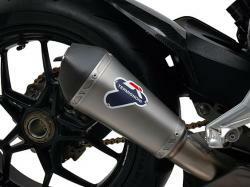 Find the Termignoni exhaust which best suits your MV Agusta model and improve the performance of your bike. With the Italian Sound, you'll love the two wheels at the highest levels.